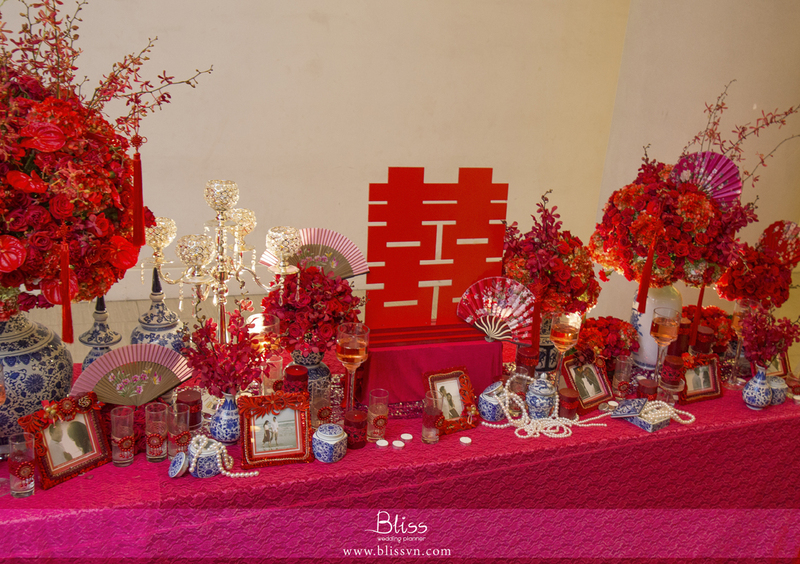 Red is a familiar color that always appears in Chinese wedding, however it's hard to create a modern look in a traditional Chinese wedding. 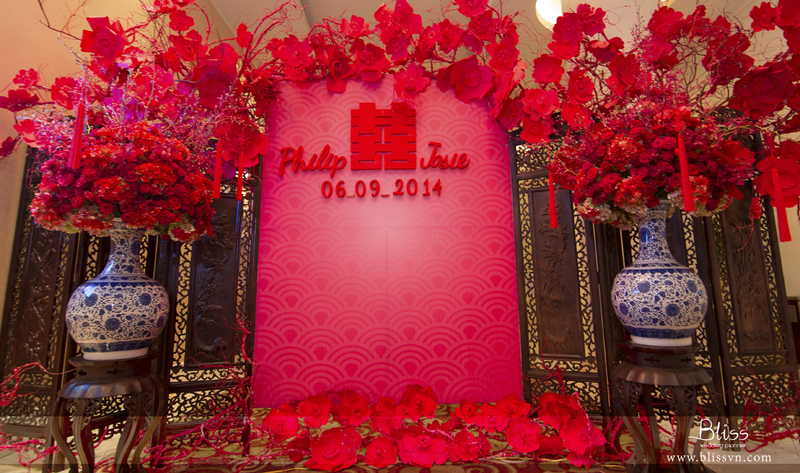 Red color is really familiar with Bliss but decorate it in Chinese way is the first time. The couples Phat and Trinh met Bliss (Viet nam wedding planner) at the autumn evening time with the wish that Bliss will help them to create a wedding that relate to their characterized is Chinese, but not too traditional yet elegant and youthful like them. 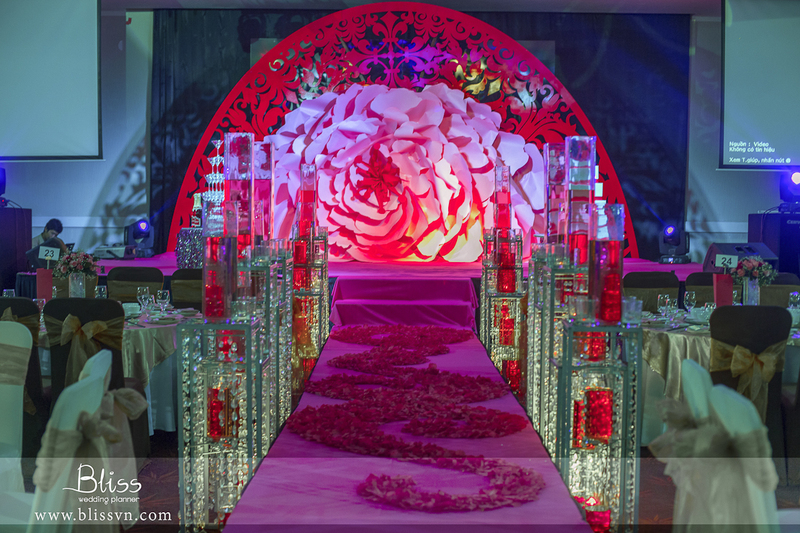 Therefore, there’s no other colors that matching with the theme of this wedding like the stunning red color. Seems really easy but the fact is totally different. Red color is really familiar with Bliss but decorate it in Chinese way is the first time. To aware that, Bliss have searched all the information and even a small details that relate to the ritual and traditional of Chinese wedding. When the guests walk in the wedding hall, they forgot this is the modern space of Riverside Palace. 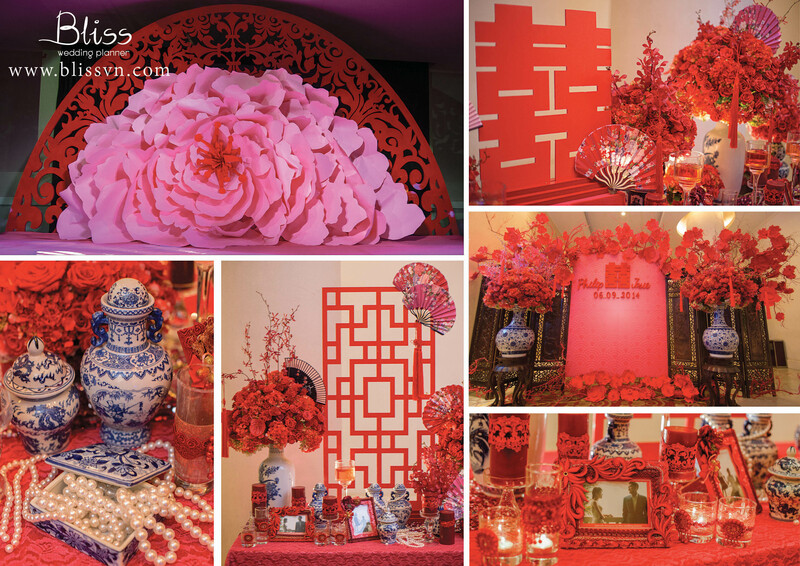 Instead, the hall was fill up by the Chinese decoration; stunning red colors combined with light pink create perfect lines of two Chinese characters that is Double Happiness. 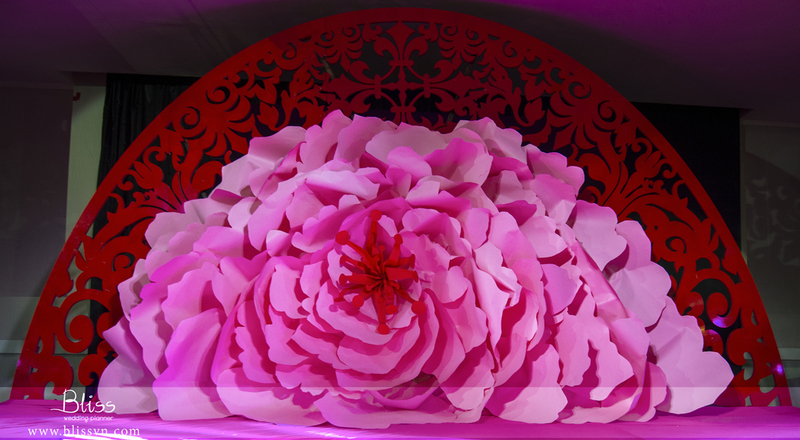 Plus, the red velvet rose are made up high and low with the combination of the hand fans and the pottery of the Minh dynasty that imported directly from China to create more Chinese traditional details of the wedding. With all the details like the velvet jewelry box or the strings of pearls in the decorations are transmission all the happiness atmosphere for the bride and the groom. Lastly, the dining hall brings the modern look to the wedding with the biggest cherry blossom on the backdrop, which made by the paper art of Viet Nam, combine with the arch and all the Chinese details on it. All the details upon that Bliss have made with only one intention that is to praise the beauty of this wedding for the couples Phat and Trinh, transmit their most happiness atmosphere to all the guest. This is also a blessed that Bliss want to send to them, their love will always ardent like the red color and the booming cherry blossom.